What started out as a trip to Bowling Green, Kentucky with his wife, quickly turned into a once in a life time adventure for Bob Dupuis. 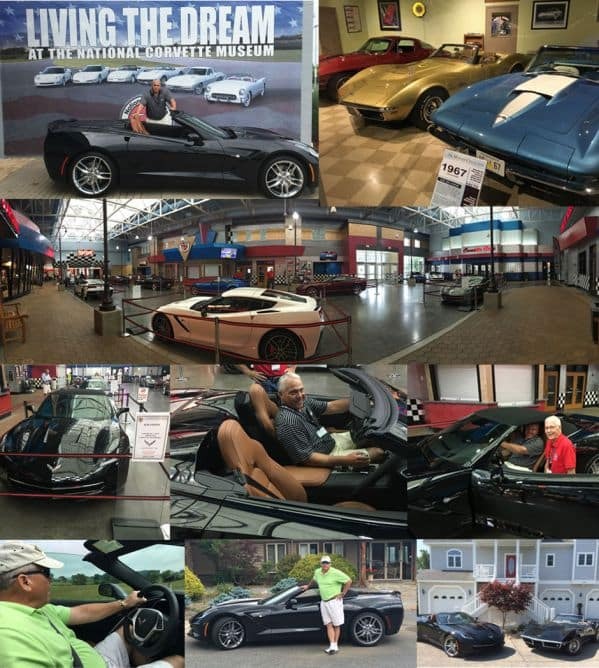 After the Plant, they went to the National Corvette Museum (located right across the street). At the NCM, Bob and Donnie were given a VIP guided tour. As they explored the museum, they saw tons of classic vehicles, had lunch at the 50’s Soda Shop themed Corvette Café, and finally made it to Corvette Boulevard. Corvette Boulevard is where Bob’s corvette was on display. The display itself was phenomenal. Bob described the first sight: “It [the corvette] was surrounded by ropes and had a fancy sign with my name on it. It was cleaned beyond clean, there wasn’t a speck of dust on it!” A member of the NCM Delivery Team provided a thorough presentation of the vehicle showing off all the buttons and features (bells and whistles) that the corvette has to offer. When all was said and done, it was finally time to take delivery of Bob’s corvette. Excitement was radiating throughout the area as the time to exit the museum approached. A crowd formed as they started the engine and prepared for the drive out. Bob also mentioned a special moment when he noticed a family standing in the crowd checking out the car. He asked the lady if he could borrow her son and he took the boy and sat him in the seat. Once in the seat, Bob asked him, “Hey how does that seat feel? Cause I’m gonna be in it for a while;” a memory that is sure to last a life time. The NCM Delivery Team member drove the car out of the museum. As soon as they made it past the large museum door, they got out and Bob took the wheel. One thing he wasn’t quite expecting was to be riding shotgun as the vehicle made its debut down Corvette Boulevard to depart the museum, but it was an exciting experience nonetheless!